With a few free days at the end of the month I decided to head over Tioga Pass and pay a visit to the Mono Peaks area, found just east of the Sierra Nevada between Mono Lake to the north and US6/US395 to the south. I had been to the area on several previous occasions, notably to climb Glass Mtn as part of the DPS list. Andy Zdon has included additional summits in his Desert Summits guide and it was to these that I was heading. None of these summits were difficult, the longest being a 3.5mi hike to Cowtrack Mtn and only because I didn't have the vehicle capable of making this a near drive-up. This is the second highest summit in the Mono Craters, a geologically young range (a plaque alongside the roadway declares it the youngest range in North America) located east of US395 just south of Mono Lake. I had been to the higher point previously (also in Zdon's book) but came back just for this one. I found a good dirt/sand road on the east side of the range that would allow me to drive within a mile and quarter of the summit. Some modestly sandy parts of the road made me happy to at least have front-wheel drive for added traction. I parked off the road and made a beeline for the summit to the west, starting just before 8a. The initial climb up forested slopes is easy enough but the more open sand slopes found higher up were quite tedious and steep, but thankfully short. It took me 45min to reach the summit. There are some fine views of the Sierra looking south and west and a partial view of Mono Lake to the north, blocked by the higher summit found in that direction. To the east lies Glass Mtn and the White Mtns, but this view was washed out in the early morning light. A register left in 1988 had eight pages filled, the most recent entry in 2013 by Chris Henry who I've met on the Sierra Challenge the past few years. The descent went far quicker, returning me to the start before 9:30a. Located 8mi SE of Mono Craters, Bald Mtn features a lookout and can be driven to by any vehicle, though the last quarter mile of road is rather rocky and a bit steep. I plied the USFS roads south of SR120 between the two locations, but found a large tree blocking the road. This necessitated a drive back out to SR120 before taking an alternate route to Bald Mtn to get around the roadblock. The summit lookout is in good shape, maintained at least if not occupied part-time. The most striking views are of the Sierra to the south and southwest. 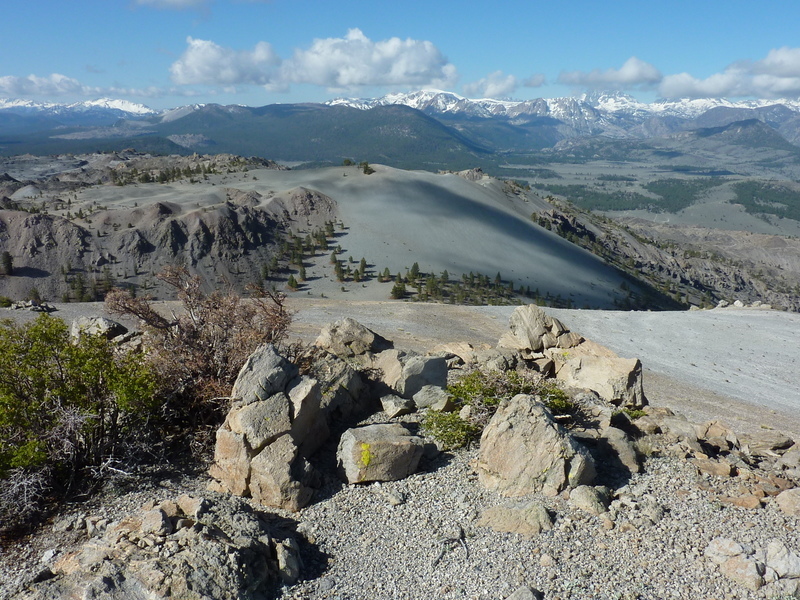 These two summits are located about 5mi NE of Bald Mtn and about 3.5mi south of SR120 on signed Sagehen Meadow Road. The road leads to, and past a private inholding found in Sagehen Meadow. The good road is navigable by any vehicle and goes over a saddle that divides the closely-spaced summits. Parking is limited at the saddle, but manageable for one vehicle. If you start off directly for Sagehen from this spot you will have some modest tree-whacking to contend with. A side road starting just down from the saddle on the south side is the better bet and can be used to drive within about 100ft of the summit with a high clearance vehicle. There are two summits to Sagehen, the one to the west and just above the end of the road is the highest. The lower eastern summit is a more interesting rock scramble according to Zdon. I took his word for it and simply visited the highpoint. To the southwest is Crooked BM, higher than Sagehen and more interesting, imho. It does not have the trivial access of Sagehen and requires some intricate route-finding and/or significant bushwhacking. The east side of the mountain is covered in a mesh of young aspens that make travel difficult. There are a few breaks in this tangled forest that can be pieced together to make the way easier up the east side, but there will be some struggle. An alternate would be to circle around the base of the south side and ascend to the summit from that less brushy side. I spent about 20min ascending this one, finding the summit open to views (as is Sagehen, btw) in all directions, with a nice view of Mono Lake to the north. Cowtrack is seen as a long, flat ridgeline extending north of SR120, southeast of Mono Lake. An unsigned dirt road runs from SR120 nearly to the summit. The quality is so-so and deteriorates the further one drives. I was treated to the sweet incense of burning sage as I drove my low-clearance van almost 3mi down this road. I stopped where it goes steeply downhill to a water tank & trough (marked on the topo map as "WT") before angling back up to the ridgeline. I wasn't sure I'd be able to get back up the soft, dirt & sand road and decided I'd already pushed the poor van beyond reason. I'd gotten nearly halfway there and could walk the rest of the way. It wasn't a particularly exciting hike, void of much elevation change and dramatic views. Granite Mtn to the southeast looked the most interesting and to its right in the background could be seen the unusually snowy summit of Glass Mtn. The weather was the most interesting aspect of this hike, threatening rain and already having dusted Glass Mtn with snow. A small herd of wild horses were grazing around the water tank when I passed by, moving off in distrust soon after I took their picture. I reached the summit of Cowtrack around 2p, finding it decidedly desert-like with little vegetation. I found a reference mark among the summit rocks but could not located the benchmark or any sort of register. The summit does have a particularly fine view of Mono Lake, the best of the summits on this side of it. Thunderstorms were dumping precipitation over Glass Mtn as I was returning, some of them beginning to move north in my direction. Any sort of rain held off for the time being, allowing me to return dry to the van not long after 3:15p. The last summit I visited was the most interesting on the day. At nearly 9,000ft, it is the highest summit between Mono Lake and SR120, a P1K and the highpoint of the Granite Mtn Wilderness. A BLM dirt/sand road leads from SR120 north about a mile before encountering the Wilderness boundary. From here it's less than a mile and a half to the summit. The summit and surrounding hills feature some good rock scrambling and probably have some quality rock climbing if anyone bothered to develop it. There are remnants of an old road, now trail, leading from the parking area towards the south side of the mountain up a shallow canyon. The canyon narrows and steepens as it climbs towards a saddle SW of the summit. Class 2-3 rock scrambling leads to the summit from this saddle. Easier class 2 terrain can be found by climbing to an alternate saddle SE of the summit and then around the east side to approach the summit from the NE. I spent just under an hour to reach the rocky top. In addition to the benchmark, I found a register left by Dan Baxter a year earlier. Dennis Poulin's was the only other name I recognized from the handful of additional visitors. As I was leaving the summit to return via the eastside route, raindrops began to fall from a thunderstorm now overhead and soon turned into a soaking. I got out my rain jacket and pack cover to keep things from getting saturated and enjoyed my first rainy outing in some time. The rain didn't last long, enough to soak my pants and boots but not my spirits, and by 5:30p I was back at the van and done for the day.